The Rolex Submariner Date is the quintessential diving watch. Its Cyclops lens magnifies the date display and is a hallmark of this timepiece. 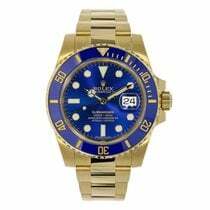 There are stainless steel, gold, and bicolor variants available with black, blue, or green dials. Most people can't imagine the Rolex Submariner without a date display. Even the rather unpopular Cyclops lens is seen by many as an inseparable part of this diving watch. Rolex first added the date function to this line in the mid-1960s, starting with models under the reference number 1680. Today, the Submariner Date is one of the Swiss luxury watch brand's most beloved watches. 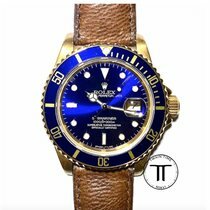 Its 40-mm Oyster case features a screw-down case back and the patented Triplock crown, lending this timepiece its water resistance of 300 m (30 bar, 984 ft). It also includes a unidirectional bezel. The large, glow-in-the-dark indices and hands are easy to read, even in the dark. Compared to its sister model without a date display, the Submariner No Date, models with a date display offer a much wider variety of design options. The Submariner Date's cases and bracelets come in stainless steel, yellow gold, white gold, or Rolesor, a bicolor variant that combines stainless steel and 18-karat yellow gold. The Submariner Date is also available with a number of different dial and bezel colors, such as black, blue, or green. 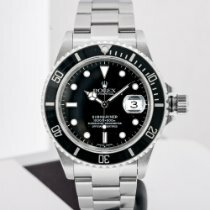 How much does a Submariner Date cost? 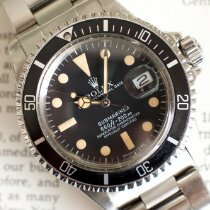 Many factors influence the price of a Submariner Date, including its year of production, condition, and materials. Unsurprisingly, stainless steel models are less expensive than those in gold. Plan to spend around 10,100 USD on a new stainless steel timepiece with a black dial and bezel from the current collection (ref. 116610LN). This same watch starts at about 8,100 USD pre-owned. If you're looking for an early, vintage model – such as the Submariner Date 1680 – be prepared to dig a bit deeper into your pockets. Depending on the watch's condition, prices range from 10,900 to 16,700 USD. With its green bezel and black dial, the anniversary edition of the Submariner Date from 2003 is a coveted collector's item. This watch has the reference number 16610LV and is known as the " Kermit" by fans. A never-worn example costs around 16,300 USD, while a pre-owned model in good condition goes for about 11,800 USD. The ref. 116610LV is even less expensive. This timepiece not only has a green bezel, but also a green dial, which is why it is often referred to as the " Hulk." This model demands around 11,400 USD new and 10,400 USD pre-owned. The first Submariner Date with a yellow gold case and bracelet bore the reference number 16618. Rolex offered this watch with its dial and bezel in either black or blue. Regardless of the color, prices for this timepiece come in between 20,300 and 28,700 USD. New yellow gold models with the reference number 116618 also come with black or blue elements. They sit in a similar price range, going for around 26,400 USD pre-owned and 28,600 USD new. 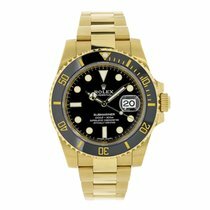 Rolex refers to the bicolor versions in stainless steel and yellow gold as Rolesor. Watches with this finish can be found under the reference number 116613LB or LN. The letters "LB" and "LN" stand for lunette bleu (blue bezel) and lunette noir (black bezel), respectively. The dials also come in the corresponding color. Pre-owned pieces cost around 11,700 USD, while those in mint condition cost about 1,200 USD more. You can save a bit of money by buying an older model with the reference number 16613. These vintage watches cost between 8,700 and 9,700 USD. If a Submariner Date in white gold is more your style, you should take a closer look at the ref. 116619LB. As you may have guessed by the reference number, this model is outfitted with a blue bezel and dial. One of these watches demands around 30,300 USD new and 26,300 USD pre-owned in very good condition. Thanks to its careful construction, every Submariner Date since the ref. 16800 has been water resistant to 300 m (30 bar, 984 ft). Older models could withstand up to 20 bar (200 m, 656 ft) of water pressure. Like all Oyster models, the case is composed of a single piece, known as monobloc, and the case back is screwed on to the center section. The ref. 16800 also marked the introduction of scratch-resistant sapphire glass to the series. How well a timepiece can keep water out is a crucial characteristic of a diving watch. The crown is a possible weak point, as it requires a hole be made in the case. This is why Rolex outfitted the Submariner Date with their Triplock system, which features four rubber gaskets to keep out water and dirt. Otherwise, the crown is screwed down into the case when not in use. It is only unscrewed when the watch needs to be set or manually wound. A counterclockwise unidirectional bezel is also a mandatory feature of diving watches. This allows you to easily keep track of how long you have been underwater. It's impossible to turn the bezel clockwise, meaning the dive time cannot accidentally be lengthened. It's also important to be able to tell the time in darkness. This is why the Submariner is equipped with luminous hands and indices. Since the ref. 116610, Rolex has been using their own luminous material, Chromalight, which glows blue in the dark. Chromalight's color differs from the previously-used luminous substance, Superluminova, which glows green.